Stay Fit, Stay Healthy! Well, that’s what I believe to lead a good life amongst all these hardships and stress. Fitness often gives you a sound sense of personal satisfaction, and we all have our goals to fulfill. Whether you want to lose weight or either you are craving for hard abs but it all becomes very hard to manage without giving proper attention, and most of the people end up disappointed until you can find an app that can do all of this for you. Well, today I’m only here to enlighten you all with a great app designed for proper Fitness Training and Gym. It is a unique way to manage and achieve your workout goals and fitness sessions. The app is fully customizable and lets you add integrate your training, schedules, personal training management, and much more from your smartphones. 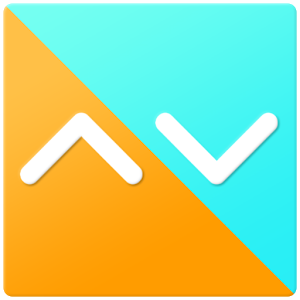 So without any more blabbering, let’s start the review of the UpDown App. The sole reason that people don’t work out is the lack of motivation. In the starting days, you’ll all feel pumped up and energetic but what after it. Fortunately, this application allows motivates you and provides with a whole new set of features and options that would improve your workout sessions. 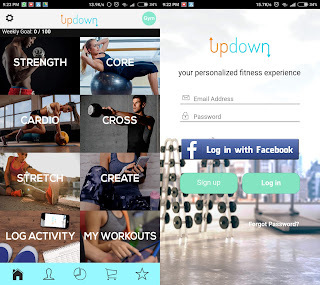 Updown Fitness is one of the most customizable and inclusive fitness training app amongst the Fitness Category, and I am reviewing it because it effectively serves the purpose that other applications failed to do, motivates the user. The app is a must-have app if you’re love working out or if you want to start. So, let’s get started with all the installation and stuff. To start your highly motivated sessions, you’ll need to download the application for your smartphone. The app is available for both Android & iOS devices. The app is free to download and can be found in the official stores. Moreover, you can also go for the plus membership, allowing you to win extra rewards and stuff from companies like Adidas. The iOS version is compatible with iPhones, iPod and even iPad with data syncing and cloud services. You are greeted with a stylish and bold design with a simple tap on dashboard layout. 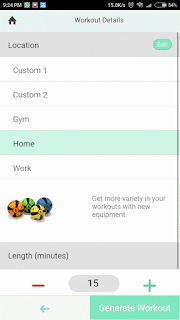 The app is smartly crafted to curate a personalized training and workout schedule. All the exercise categories are divided into five categories including cardio, cross, core, stretching, and strength. You can easily customize the duration and the intensity of your workout. Also, you can create your custom training session from dozens of exercises to choose from. Talking about the app, let’s discuss all the features that if offers to all the gym enthusiasts. I used the application for my gym session daily for two weeks. The app is very simple to use, and all you need to is just to sign up and choose your session type. Virtual Trainer: - The app keeps track of all your exercises throughout the sessions with voice cues, and guides you about when to stop? How many practices are left? And much more. Sample Videos: - All the exercises added to the app consist inbuilt videos that are often useful if you haven’t tried it before. You can also configure the app to display the video as you exercise in the gym. Fully Customizable: - Since the app is dedicated to the users, you are all entitled to customize your sessions and workouts. You can also duplicate exercises, swap or even remove them according to your own and by the time you’re done with the workout, the app tells you about all the calories that you’ve burned. The Motivator: - The best thing about the app is that you’re showered with a lot of motivation and enthusiasm to workout. Frankly speaking, it helped me a lot to workout with more dedication & going to help you too. Updown is free and doesn’t charge you anything to sign-up. The app was launched in November of 2015. Updown has now also added an autoplay option, so you won’t need to touch your device during the workouts. One can also upgrade his account for the premium features for as low as $5/mo. It looks great and serves the best motivation with all the features for a fitness app. 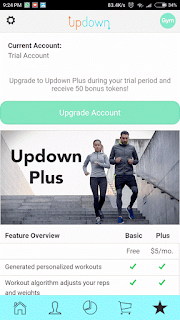 Exercise according to your pace and get all the guidance, motivation, and support from UpDown. Do comment about the app below. Cheers! Thanks for this nice review. I was using some other apps and will try this app to get fit.